Masingita Masunga, a brave and determined South African who was born with cerebral palsy, has proven that no matter what one’s circumstance are, if there’s a will, there’s a way. 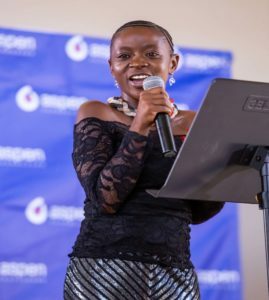 Masingita is the founder of the Walk in My Shoes campaign that was launched in Soweto, Johannesburg on 14 December 2018. “The Walk in My Shoes campaign seeks to bring people of varying circumstances together and to help one other,” said Masingita. Aspen, in partnership with the Department of Communications, is supporting the campaign. “It’s time that corporate South Africa plays its part in society and assists in developing sustainable communities. Aspen has taken up the challenge and committed to collecting 3 000 pairs of shoes towards the campaign,” said Nicolaou. Deputy Minister of Communications Pinky Kekana urged South Africans wishing to donate shoes to do so at any GCIS center across the country. Despite living with cerebral palsy – a disorder that impairs movement and affects muscle tone or posture, Masunga managed to summit Mount Kilimanjaro, the highest mountain in Africa early in 2018. Her next adventure will see her travel from Cape Town to Cairo to assist underprivileged families across the continent.